Timex Kids' Digital Flames Watch Just $9! Down from $22.95! You are here: Home / Great Deals / Amazon Deals / Timex Kids’ Digital Flames Watch Just $9! Down from $22.95! Timex Kids’ Digital Flames Watch Just $9! Down from $22.95! 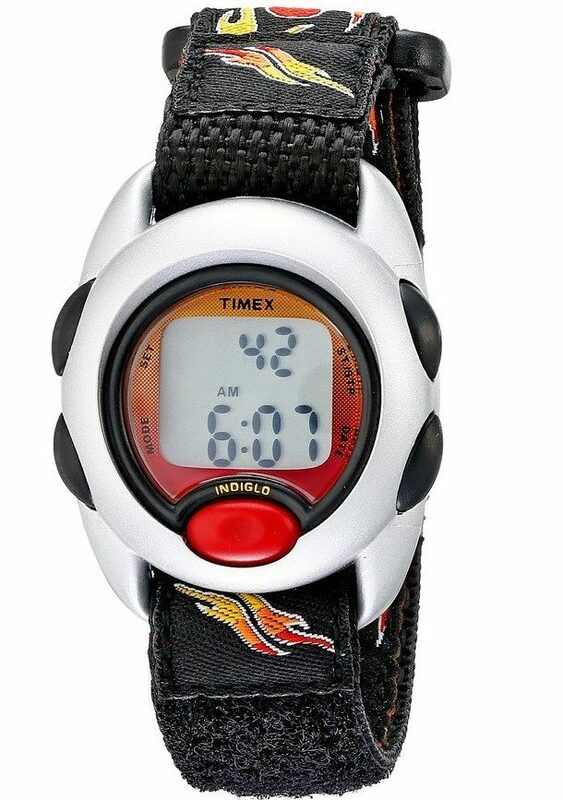 You can get this Timex Kids’ T78751 Digital Flames Fast Wrap Velcro Strap Watch for just $9! Down from $22.95! The Timex T78751 Youth digital watch is reliable, durable, and readable in the dark, thanks to the integrated Indiglo night-light, but it’s also flat-out fun to wear. It features an easily readable digital display with large, recognizable icons for the chrono, alarm, and timer functions, and a comfortable velcro fabric strap (for better dirt and stain resistance) with a race car flames against a black base. This watch also offers water resistance to 30 meters (99 feet), 12/24-hour time, durable silver resin case, large function buttons, and Timex’s unique Kids Loss Protection Plan. It’s recommended for children ages 6 and older. Timex understands that kids often lose things, even their most prized possessions, which is why this watch is covered by the Timex Kids Loss Protection Plan. If the watch is lost, Timex will replace it with the same style (or similar if your style is not available) at the price of $10 for up to one year from the original date of purchase, with no questions asked. Details are included in the printed instructions that come with the watch.